Why not start St. Patrick’s Day with a big pancake breakfast? This recipe is simple and delicious! One of the things we’ve come to love on pancakes is yogurt sauce. I strain yogurt until it is thin, then stir in a little honey and drizzle it over pancakes. For St. Paddy’s Day this year, I decided to add in a few shamrock sprinkles. I then attempted to make a clover shape on top of the pancakes. As you can see, my artistic skills leave a lot to be desired. Oh well, there is always next year! 1. Make the pancakes according to directions. 2. To make the yogurt sauce, line a strainer with cheesecloth and scoop the yogurt into it. Allow it to strain in the refrigerator for at least two hours. 3. 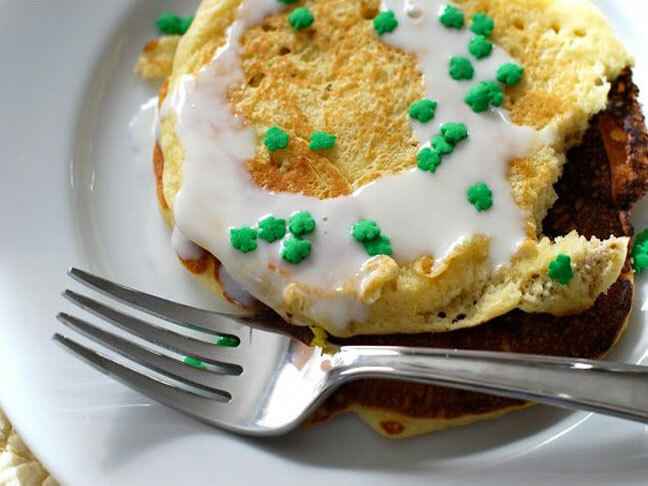 Stir in the honey and drizzle over the pancakes, add your Shamrock Sprinkles and serve!